Historic Cobblestone, reclaimed Belgian Block are one of REALGOODS Company’s specialty. Antique Granite Cobblestone is the stone that put us into the Cobblestone Driveway supply business in the first place. 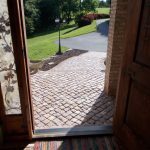 Several years ago, and into the near past, REALGOODS Company has become a supplier of Medina Cobblestone to a historic village near Columbus Ohio, that requires that any driveway, walkway or road to be constructed of Medina Cobblestone. Medina Cobblestone, a very hard and durable type of sandstone, has a range of color including purple, buff, pink, and light tan, with the lighter colors being generated by weathering. Medina Cobbles came from a formation along Lake Erie, in the vicinty of Buffalo, NY and environs. Used primarily in Ohio, New York and possibly northwest Pennsylvania. Stricly a regional cobblestone in use during the 18th century with the original quarries now long closed, the stones are only available as a reclaimed antique cobblestone or belgian block. Steve V., a resident of the historic village near Columbus Ohio contacted me last year needing a truckload of Medina Cobblestone for a current driveway project. Initially Steve wanted the colors sorted to be mostly in the buffs & tans. We always try to meet our customers requests, but the limited availability of the stone and its traditional mix of colors would have created a product that was beyond the customers budget. Even in the world of Antique Granite Cobblestone and reclaimed Belgian Block the budget tends to rule the day. 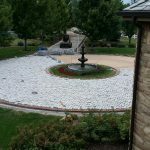 Steve decided to move forward with the unsorted Medina Cobblestone and had a successful installation, although the color was more red that his original request. If you are considering antique Medina Cobblestone or reclaimed and new Granite Cobblestone we will do everything in our power to meet you color requirements and of course the overarching budget for your project. Please call 888-433-4443 for your professional consultation! *The pictures included are not from the project described, but show the general look and texture of Medina Cobblestone.